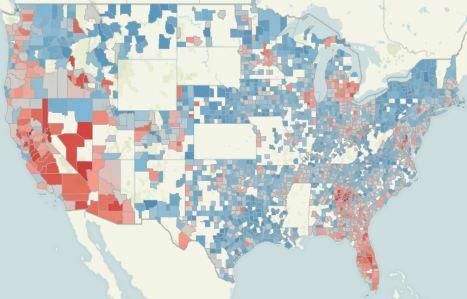 Blue areas on Zillow’s map have fewer underwater homes than the U.S. average of 30.9 percent. Red area have more. There’s good news and bad news in a recent Zillow report on “underwater” homes. The good news: The number of underwater homes in the U.S. – those with a mortgage higher than the home’s value — declined by half a percentage point in the second quarter of 2012 from the first quarter, and the outlook calls for continued improvement. That good news was even better for the San Francisco metro area, which more than quadrupled the national improvement. Here in our neck of the woods, underwater homes dropped by 2.2 percentage points in the second quarter, from 30.7 percent to 28.5 percent. Zillow credits rising home prices with helping to lift the value of 400,000 homes above their outstanding mortgage amounts in the latest quarter, and that certainly seems to hold true here. In fact, we recently wrote about the trend of rising home prices in the Bay Area and noted that July home prices rose solidly in six of Pacific Union International’s seven real estate markets. And we anticipate that trend continuing. But there’s bad news, too. Underwater homes still account for 30.9 percent of all mortgages. That’s 15.3 million homes valued at $1.15 trillion less than their mortgages. On average, owners of underwater homes owe $75,235 more than they’re worth. San Francisco homes have declined 33.6 percent from their peak on the Zillow Home Value Index, and those homes identified as underwater are valued at an average of $158,027 below their outstanding mortages, or 45 percent. Looking ahead, Zillow expects negative equity rates to falling in the coming years as underwater homes are foreclosed, sold in short sales, or have their principals reduced in a modification process, together with steadily rising home values.